Nordic Semiconductor has launched “nRF Connect for Cloud”, a free service for Cloud-based evaluation, test, and verification of Bluetooth Low Energy (Bluetooth LE) designs employing Nordic’s nRF51 and nRF52 Series multiprotocol Bluetooth LE SoCs. nRF Connect for Cloud features an intuitive workflow and offers much of the functionality of Nordic’s “nRF Connect for Desktop” and “nRF Connect for Mobile” which are popular applications used for building and developing Bluetooth LE products. nRF Connect for Cloud also supports an extensive range of standard Bluetooth services together with proprietary services such as nRF UART. Operating with all popular browsers, nRF Connect for Cloud uses web Bluetooth application programming interfaces (APIs) to push and extract data to and from the Cloud, enabling the developer to test and modify the behavior and performance of prototypes. By using the front-end and visualization features of nRF Connect for Cloud, historical data can be extracted from databases and analyzed in a browser. The product also allows engineers to monitor and interact with remote wireless IoT designs enabling the collaboration of geographically separate development teams on a single project. nRF Connect for Cloud is supported by the nRF Gateway App available for iOS and Android-powered mobile devices. The nRF Gateway App enables Nordic Bluetooth LE devices to use a smartphone-enabled Internet gateway to convert Bluetooth LE messages to ReST/MQTT/IP protocols for Cloud interoperability. The Gateway App communicates with the nRF Connect for Cloud back-end hosted on Amazon Web Services (AWS) and is based on Software as a Service (SaaS) components. By leveraging AWS industry-grade components, the app implements end-to-end data and device connectivity, guarantees reliability, and scales from a few to hundreds of Bluetooth LE devices. nRF Connect for Cloud currently supports Bluetooth LE solutions but future versions will also support Nordic’s nRF91 Series low power, global multimode LTE-M/NB-IoT System-in-Package (SiP) for cellular IoT. nRF Connect for Cloud works out-of-the-box with the Nordic Thingy:52 IoT Sensor Kit, Nordic nRF5 development kit (DK), and software development kit (SDK) examples. A quick-start guide is available from www.nrfcloud.com. 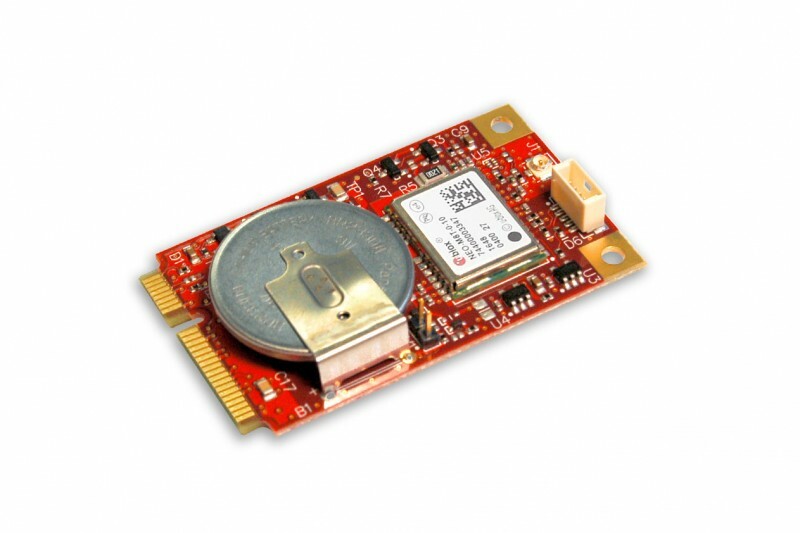 Versalogic has released an industrial temperature GPS module that provides access to multiple satellite systems. It offers higher accuracy than previous models, for both location and timing data. Its multi-channel capability also allows better accuracy and coverage in difficult environments such as cityscape / building canyons. This advanced GPS receiver provides two simultaneous receiver paths with 72-channel operation for stable satellite tracking, as well as aided startup for fast initial signal acquisition. Increased coverage is provided by support for the GPS (United States), GLONASS (Russian), Galileo (European Union), and BeiDou (China) systems. In addition to positioning and navigation applications, GPS/GNSS signals are widely used as precision time or frequency references for remote or distributed wireless communication, industrial, financial, and power-distribution equipment. The G3’s extremely small Mini PCIe format allows it to be added to a system with very little impact to the overall size of the system. The G3 is compatible with a variety of popular x86 operating systems including Windows, Windows Embedded, and Linux using standard software drivers. The G3 is designed and tested for industrial temperature (-40° to +85°C) operation and meets MIL-STD-202G specifications to withstand high impact and vibration. It is RoHS compliant, and includes VersaLogic’s 5+ year production life guarantee. The G3 is customizable, even in low OEM quantities. Customization options include conformal coating, revision locks, custom labeling, customized testing and screening and so on. The VL-MPEu-G3E is available from stock. Pricing is $190 in OEM quantities.